10kg/ paper drum(D31cm*H34cm); 25kg/paper-drum (D31cm*H51cm or D41cm*H51cm). Polyethylene bag inside. Ginger (Zingiber officinale Rosc.) is a perennial herb of genus Zingiberaceae, native to Central China, southeast to southwest of China. The stem, rhizome and leaf of ginger all can be extracted into essential oil and powder, which used in food, drinks, spice, medicine, supplement and cosmetics. HACCP, HALAL, KOSHER, FDA No. 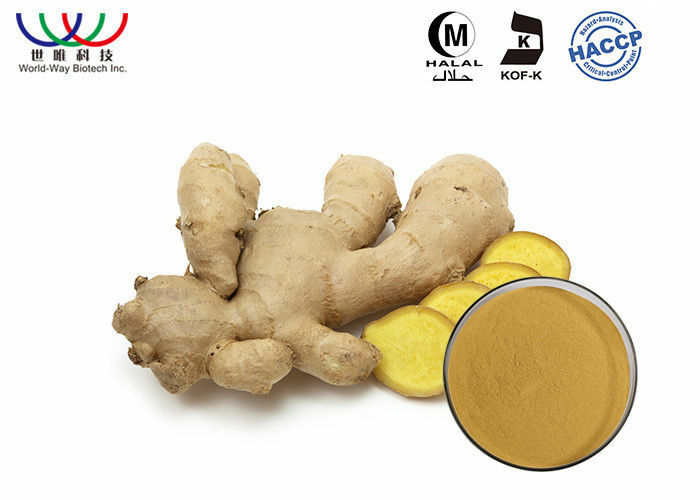 Ginger extract is suitable for food, pharmaceutical, and cosmetic filed, as the function of promoting blood circulation and regulating breathing, keeping skin wrinkleless and hair exuberant. Packaging and storage 1) Sample-packing: packed with PE bag then put in aluminum foil bag. 2) Production-packing: 10kg/ paper drum(D31cm*H34cm); 25kg/paper-drum (D31cm*H51cm or D41cm*H51cm). Polyethylene bag inside. Delivery details For urgent order and light weight, choose the following express: UPS, FedEx, DHL, EMS. World-Way Inc. consists of an experienced team which has practical experience in the manufacture and distribution of herbal extract to the international market. We look forward to working with you to develop cost effective products and long term relationships with mutual benefit. World-Way owns and manages his factorie, R&D center and plant base. —— Invest in Milcota Inc. specialized in herbal extracts and innovative natural bacteriostasis agent with an annual production capability of botanic products over 1000 Tons. —— Establish a R&D center named HerbEx. Actinng as a public project of Changsha National Biomecical Industrial Base, HerbEx has lots of notable senior researchers within the industry, whose work will strongly support in QA/QC and R&D and keep the first-class technical and QA/QC levels of World-Way Inc.
—— Have Plant Bases over 1000 mu as our backup of raw materials. World-Way Inc. is uniquely experienced in providing quality herbal extracts. From simple ratio extracts to standardized extracts and purified natural ingredients , we offer the variety and quality of extracts you need to ensure the success of your products. Besides, World-way has been dealing with fine chemical products of high-quality and reasonable price. Latin Name: Zingiber officinale L.